Semiconductor pioneer T.J. Rodgers (founder and CEO of Cypress Semiconductor) and his longtime domestic partner Valeta Massey have begun a project in the Santa Cruz Mountains to produce the best Pinot Noir in the world. 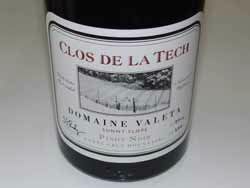 Clos de la Tech was founded in 1994, and currently produces small lots of estate Pinot Noir from three vineyard sites. Rodgers plans to gradually increase production as his vineyards develop, eventually reaching 10,000 cases. 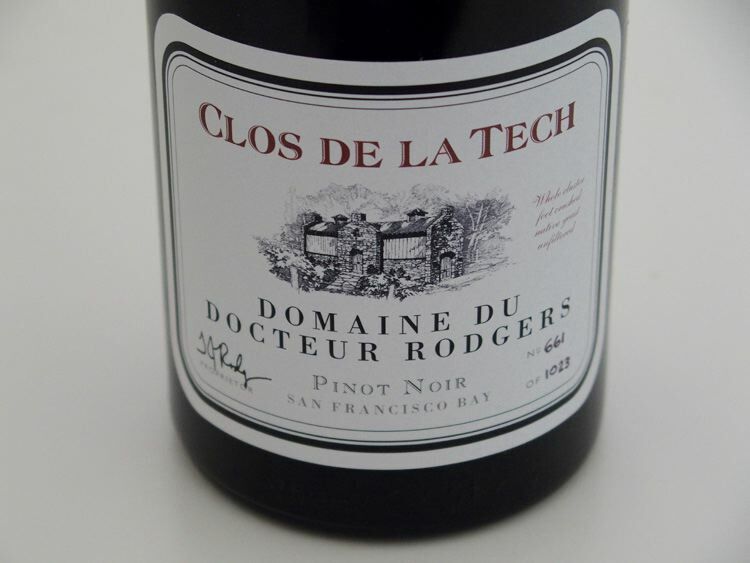 Rodgers has named his three vineyards Domaine Docteur Rodgers, Domaine Valeta, and Domaine Lois Louise. Domaine Docteur Rodgers is a one-acre vineyard adjacent to Rodgers’ home in Woodside planted to Dijon clones 113, 115 and 777. Close-spacing of vines and small yields are the norm here. When T,J. and Valeta Massey built a home in Woodside, California, they planted this vineyard and when the first grapes appeared, they tried their hand at making wine. The first Clos de la Tech wines were sourced from this vineyard beginning in 1996. Vintage 2000 was the first commercial release offered in 2005. With their initial success, they bought two pieces of property in the Santa Cruz Mountains to develop vineyards. The Domaine Valeta vineyard is 3 1/2 planted acres on a 30-acre site perched on a peak at 2,300 feet looking down on Silicon Valley. This is a colder site, producing wines that are more tannic and aromatic than those from Rodgers. The first wine made from this vineyard is the 2002 vintage, to be released in 2007. Domaine Lois Louise, named after Rodger’s mother, is a 35-acre ridge-top vineyard (on its way to 62 total planted acres) facing the Pacific Ocean within a 160-acre parcel in the hills above La Honda. This is probably the steepest vineyard in California. The first wine produced from this vineyard was the 2004 vintage. Eventually, 80 acres will be planted here and the wine will be made inside three 300 ft. caves blasted out from the hillside. It is hoped that a number of distinguished microclimates will be identified within this ridge-top vineyard, allowing the bottling of unique “grand cru” quality wines from separate blocks. There is no intention of blending grapes from the vineyard to produce a communal wine. Because of the challenges of farming this vineyard with its variable and double slope topography, Rodgers has designed a special tractor that runs on cables and can be controlled with a joy stick. The vertical slope in places is a jaw dropping 66% and the horizontal slope is simultaneously 25%. It is the only tractor in the world that will accommodate large vertical and side slopes at the same time. The new winery facility at Domaine Lois Louise will utilize gravity flow and plans are to install 56 fermenters to allow simultaneous fermentation of multiple eight-barrel lots of wine. A special press was designed by Rodgers that can be moved to the tank and must without separating the press and free run juice. The result is that he can use both in making the final wine. Several pieces of equipment were designed by T.J. who is an engineer. These include the CDLT Press (very much like the French Mellor coffee pot, very gently presses the cap through the wine, with the resulting press and free-run wine equal in quality), CDLT Slope Management Systems (SMS) (a tractor capable of dealing with the hills at Domaine Lois Louise, pulled up hill by cables and control achieved by a joystick, just like a video game), and TJ Fermenters (a system donated by T.J. to UC Davis that allows monitoring and control of temperature, cap temperature, measure Brix, perform pumpovers as well as introduce oxygen in the just the right amount). Four of the five wines produced have a modern silicon chip on the neck of the bottle. The limited production wines are sold through a mailing list.